Through the preliminary phases of the last semester, we could define exactly what is possible and necessary for the school of the future in Bertoua. Based on this, we have set the basic principles and criteria for the final design. In the winter semester, the qualities of the two preceding designs are checked again and united during the first weeks. Then the detailed design and the development of a larger scale to the last detail begins. In this process we we thought about to create a "Catalog" to respond to the realities on site. The design of the primary school with integrated competence center for adult education in the provincial capital Bertoua, is characterized by the integration of a climate-and region-oriented, ecological building concept, which creates innovative learning, accommodation and meeting places so for both students and teachers as well as for the general population it makes an important contribution to the future development of society. This function as educational and social-creating initiator is of particular importance, since the direct environment is characterized by rapid growth, in which people from rural areas are mainly setteling, because they can’t generate an adequate income in agriculture or where subsistence farming or the subsistence farming due to dwindling arable land has become impossible. The primary school is not to offer only general knowledge after the Cameroonian curriculum as a wide range of training opportunities, regardless of age or cultural background and allow access to adequate education, were for all those the attendance of established educational institutions on the basis of ethical, religious, social or financial reasons has been denied. The room arrangement includes six classrooms, a room for a pre-school class, a teachers room with the possibility of media use and a multi-purpose area, for e.g. workshops or the "Summer Schools" of the “Hope Foundation”, a public square as a forum for the society, on which major events such as weekly markets, dances and community gatherings can be held. 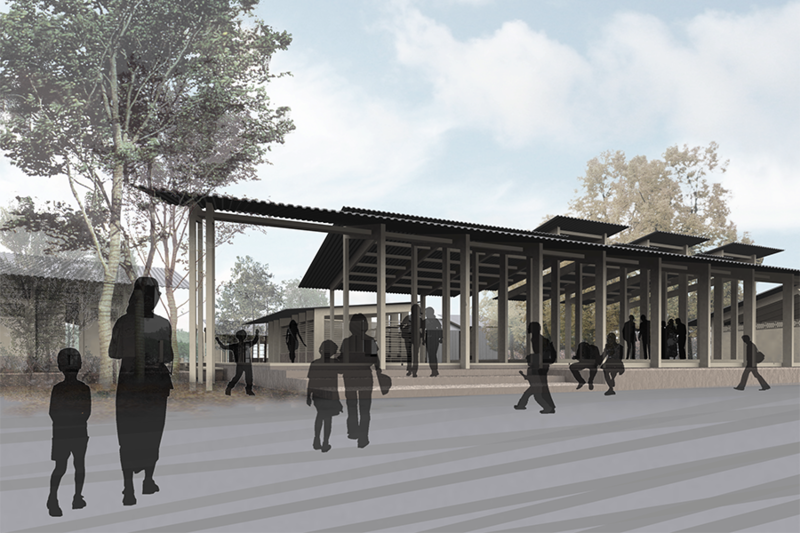 Located on former farmland and as the first building in the vicinity of the spatial structure, there is a need to formulate an official and institutional gesture, which demonstrates a necessary level of security awareness at the public access road as well as to meet the demand for open structures, which allows the integration of formal as informal learning. The main element to define the different spatial situations are wall panels jutting out into the landscape and which span the interior and exterior spaces. The side of the building which is oriented to the city and public space, is formed by thick and solid wall panels which in addition to the shielding effect also provides special functions such as market stalls and seating possibilities. They are also a perceptible threshold between the public area and the private school area. This threshold is emphasized by the covered multi-purpose hall and the rooms for teachers and administration. In this place, visitors as well as parents of the students have the possibility of exchange and could already observe the functionality of the learning environment, without the students would feel unguarded inside the school or at the mercy of the public. Thus all members of the community should be informed and animated, to participate in the school curriculum and to internalize the importance of education and the resulting opportunities. 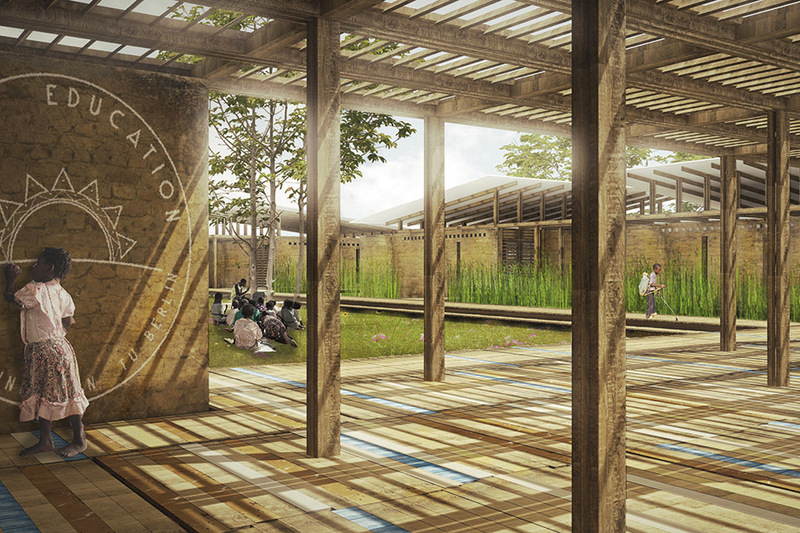 After passing through the semi-public multi-purpose area, ​​the visitor's eye opens into a spacious courtyard, which satisfies the urge of young students, invites to play and can be used for all kinds of gatherings of the students. Around this central space, classrooms are designed as solitary pavilions and are grouped and formed by walls projecting into the surrounding which define both cash counters, outside learning areas and more intimate intermediate areas. Through this integration of the classrooms with each other and with the surrounding nature, countless learning and play situations can be generated. This intermediate areas decreases gradually in the rear of the school to clear the ratio of open and enclosed space, so it can be responsive to the needs of students of all ages by means of interior design and are connected together with individual outdoor spaces depending on the requirements of the classroom.These individual elements are interconnected by a system of indexing and circulation paths which provides a necessary distance from the ground in the rainy season, assign appropriate zones to each room and form individually designed learning courtyards and alcoves. 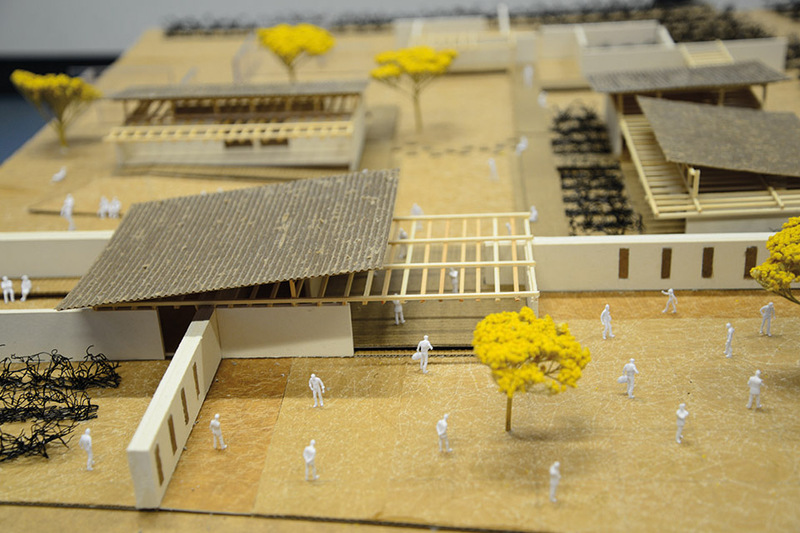 This type of space development allows to formulate innovative, users adapted learning situations and at the same time to meet the specific requirements of the local context, so that a sustainable school model can be implemented and opens new perspectives and possibilities of the future as today's society. 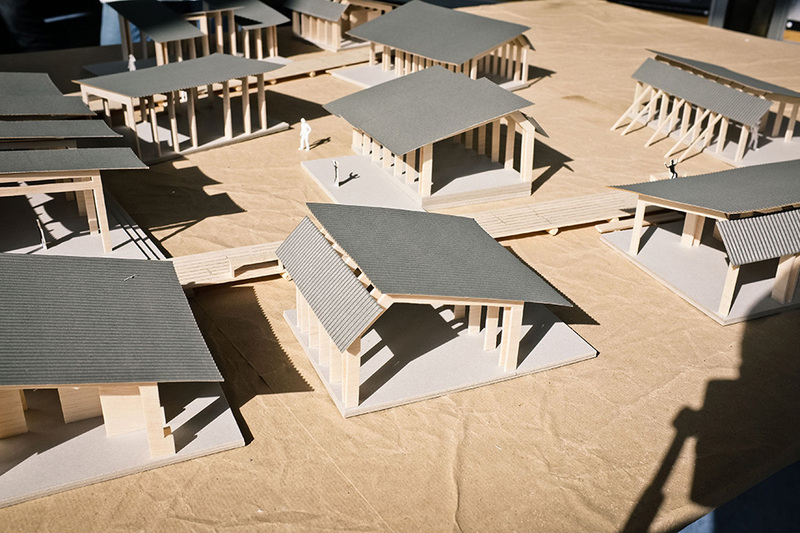 A preliminary architectural competition in the multi-phase process has already taken place in order to investigate the possibilities and potentials of such a design. 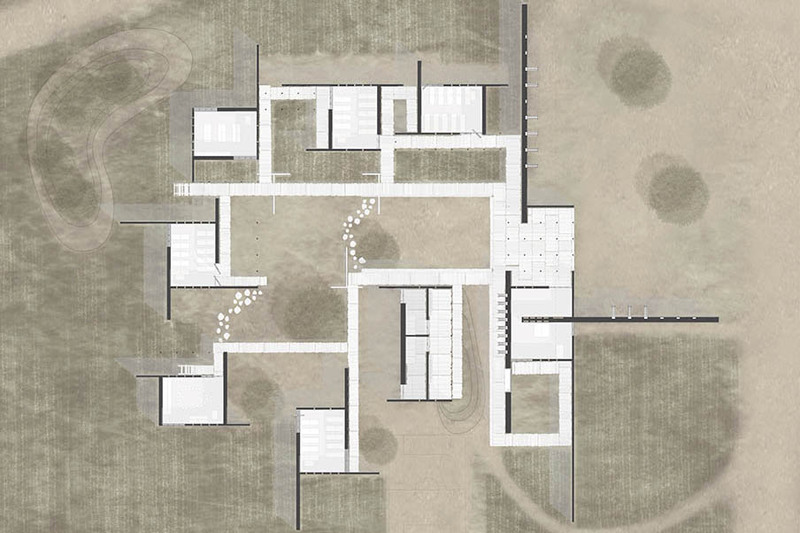 Because of the resulting insights and critics the group was formed to larger work groups to take advantage in three different principles regarding the school design to pursue it further architecturally. Two teams focused on the issue extroversion vs. introversion. Openness, because both could turn out to be a quality. 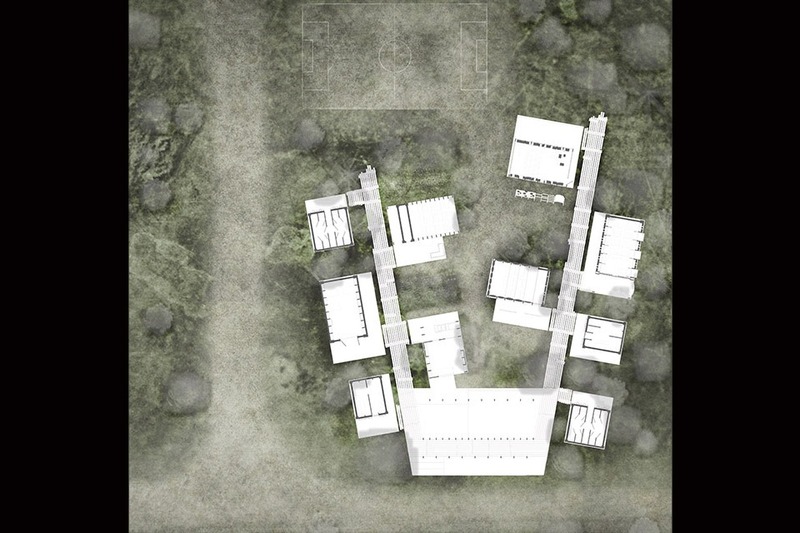 The third team, however, specialized in participatory strategies and possible "building systems" on-site. The "Education Harbor" is a design with the focus on an inclusion of the entire local community through a programmatic offer which goes far beyond that of a traditional school. By integrating various social meeting places, or by integrating the schoolyard and the school building into public outdoor areas, in which students, teachers, parents and external visitors have the opportunity to communicate, to share their thoughts with each other and to know each other, the situation regarding to discrimination, anonymity and the resulting lack of perspective can be significantly improved. In addition, the teachers at the school will grow more closely together and be able to operate more effectively and creatively regarding to their teaching tasks. 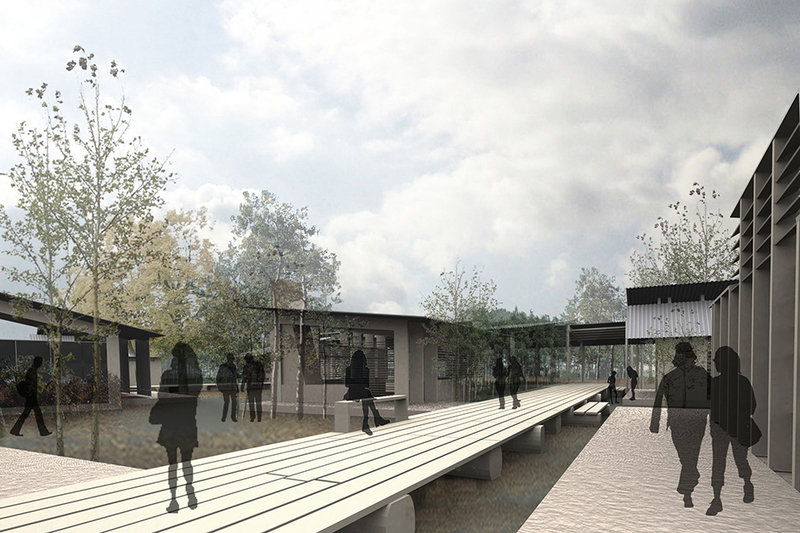 These so-called 'meeting areas' are defined by their degree of privacy and publicity, such as the playground, multipurpose hall, teacher and director’s rooms, etc… The background of this design is a rapidly growing urban community and the associated loss of local, ethnic identity, which is to be recovered by the new building. The idea of ​​the "Education Harbor" emerges of the symbolic importance of a port as a protected and safe place, the pictorial presentation of a harbour, consisting of a variety of elements that relate to the functions which can be be transferred within the school. The architectural design of the school is strongly influenced by the 'terminal' building, which is oriented to the city, both as a gateway, but above all as a smooth transition from the city in the building. The whole community has access to this area and can exchange knowledge and experience freely with each other. 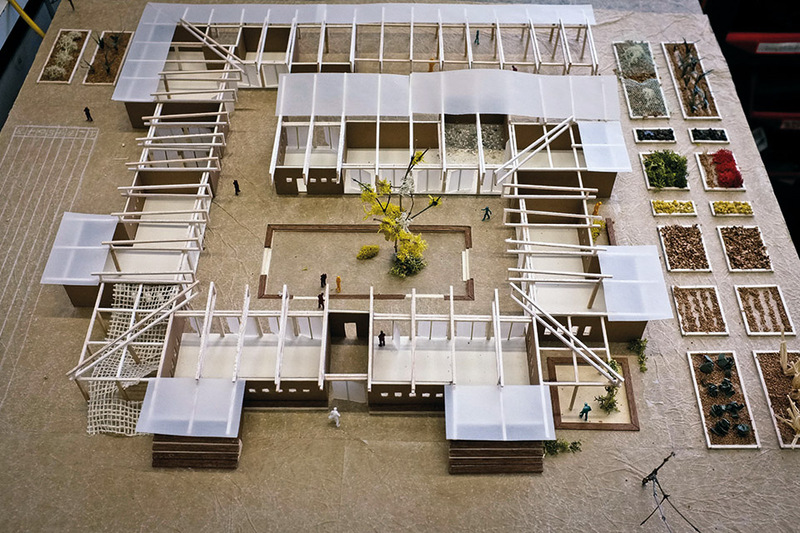 Likewise in this open and flexible structure, the multi-purpose hall is located.In the same instance, this part of the complex represents a soft threshold and thus a light barrier to something more private and oriented to the courtyard classrooms. The classrooms dock as boats in the harbor to a bridge, which acts as a development extension of the classroom, or creative area. This are autonomous, very individually designed classrooms that are highly flexible in their structure and which very deliberately take advantage of their immediate outdoor spaces. Wonderwall is a simple building consisting only of a wall in which both the school and a community center are located. 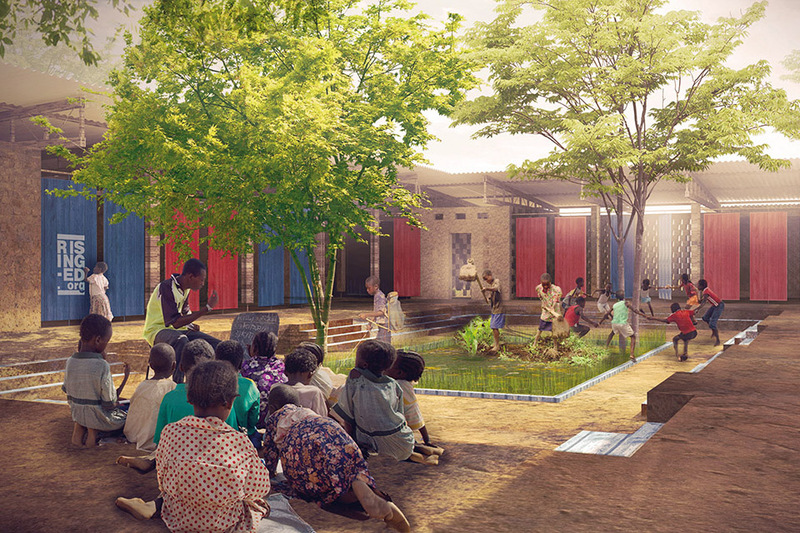 By building a single 3m high wall not only spaces for learning, but also for sports, cooking, administration, agriculture and gardens will be created for 250 students. 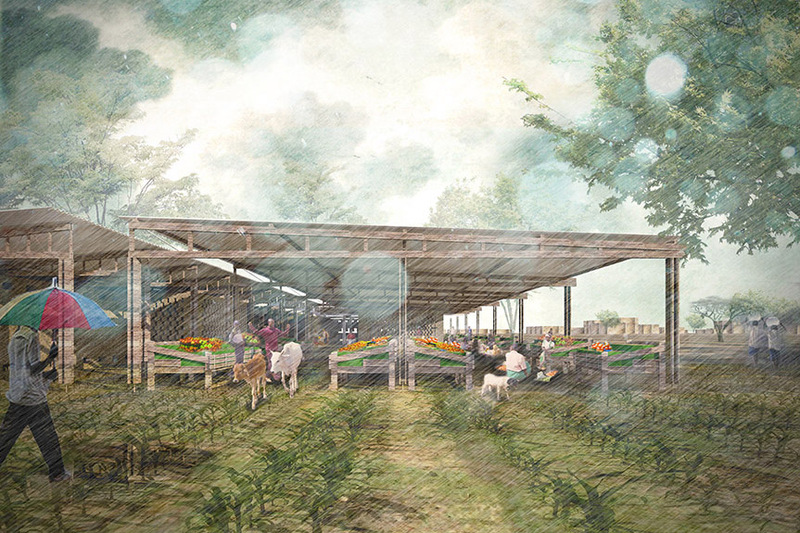 The idea is to allow not only the students, but also the entire community of Bertoua to make the architecture; so this building could be the heart of the local community. 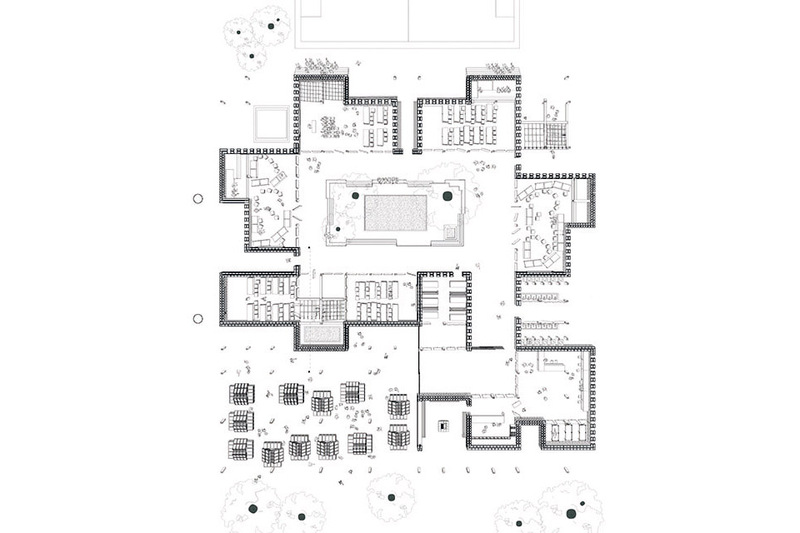 The thick Wonderwall, that surrounds the entire school, individually adapts to the program and the atmospheric parameters of the desired rooms within the building.. The Wonderwall will primarily act as a safety precaution and isolation of the school. It creates all spaces by themselves by being sometimes an exterior or interior wall. In addition to the programmatic requirements of the wall in the location, the wall in capable of generating desired atmospheres through light, natural ventilation, colour, pattern and planting. The aspect of security pervades the whole concept. By dividing the building into four security levels, the design achieved safe learning spaces within a still relatively 'open' floor plan. The building has a single passage from the outer areas into the interior and thus also the possibility to open or close the entire school complex as needed. Complementary to this, there is a courtyard created within whose degree of publicity, can be regulated by closing the wall elements of the individual classroom. In addition, the space program in this design is used as a further security measure. The materiality and form of the building's roof takes up elements of local architecture and reinterpreted them to create atmospherically innovative and functional spaces. In addition to the aesthetic qualities, the building is structurally made with masonry brick walls, which are complemented by a wood truss roof as a substructure. The six class rooms are traditional classrooms with niches, and each classrooom corresponds to the age level. The user will move from year to year in the next room. The rooms are on the introverted side of the wall, where the younger students can move back to the more sheltered areas further from the entrance of the school, whereas older students get the opportunity to interact with people outside of school. Two of the youngest classes also have a interspace so three rooms can be connected into a bigger one. lessons in larger groups for younger students in combination with specific learning techniques is often beneficial. The alternative, interstitial places of learning, which are located both on the inner and on the outer side of the Wonderwal, provide opportunities for modern, new types of instructional design. Although there is a conviction for traditional classrooms, especially for younger age groups, we believe that there must be offered alternatives for more creative learning. The administration is located right at the entrance of the building where each student must pass on his way to or from school. This provides an additional, indirect protection of the students, because the principal can assume a monitoring function right at the entrance.